The Power Pack 2 consists of a plastic battery holder that takes four 1.5 Volt “D” batteries (manganese, alkaline or Ni-Cd), with an on/off switch and a 1.12 metre cord terminating in a standard 2.1 mm DC power plug. 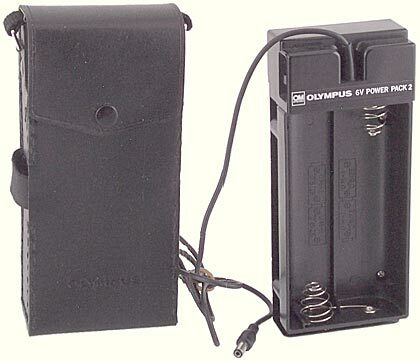 The battery holder is enclosed in an artificial leather case with an adjustable shoulder strap (maximum length 970 mm), a belt loop, and a loop for holding the cord when it is not in use. The power plug fits the power socket for the modelling lights on the T10 Ring Flash 1, T8 Ring Flash 2, T28 Macro Twin Flash 1 and T28 Macro Single Flash 1. The battery holder has markings that show the correct orientation of the batteries. As with all battery-operated equipment, the batteries should be removed to prevent leakage if the unit is not going to be used for some time. The Power Pack 2 can also be used to power the Winder 1 and Winder 2. 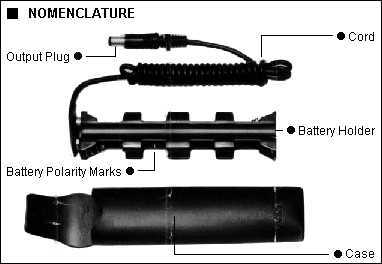 The Power Pack 1 consists of a plastic battery holder that takes four 1.5 Volt “AA” batteries (manganese, alkaline or Ni-Cd), in a soft plastic case, and a 1.2 metre cord terminating in a standard 2.1 mm DC power plug. The plug fits the power socket for the modelling lights on the T10 Ring Flash 1, T8 Ring Flash 2, T28 Macro Twin Flash 1 and T28 Macro Single Flash 1. The Power Pack 1 has a shorter battery life than the Power Pack 2. It is small enough to fit in a pocket, where body heat can keep the batteries warm enough to function in extremely cold conditions. The battery holder has markings that show the correct orientation of the batteries. The Power Pack 1 can also be used to power the Winder 1 and Winder 2. The M. 6V Power Pack 1 is a pocketable external power unit designed especially for use with the OM System Winder 1. Warmed to 15°C (59°F) or over by the photographer’s body heat, the unit allows operation of the Winder 1 in extreme temperatures as low as −10°C (14°F). Pull out the flap and remove the Battery Holder gently. If stiff, push the bottom of the case. Insert four “AA” batteries into the holder noting correct polarity. * To remove the batteries, first take them off the plus contact so as not to deform the spring contact (minus). Put the holder back into the case and replace the flap. Insert the Output Plug into the external power jack of the Winder 1 until it slops with a click. Now the batteries inside the Winder 1 are switched off automatically. The unit must be kept at a temperature of 15°C or over in an inside coat pocket. Then the camera/winder combination can be operated in an air temperature as low as −10°C. Take pictures as you would with the Winder 1 and internal batteries. Keep all the electrical contacts free from dust and dirt. Do not store the unit in very damp areas. Do not drop or hit the unit. When the unit is not used for long periods, remove the batteries to prevent leakage. Do not wipe the plastic portion with thinner or other harsh chemicals. Do not apply excess force to the connecting part of the Battery Holder and Cord.